We did a preliminary experiment to help us decide on the method and what concentrations should be used in the actual experiment. We are trying to discover what the best solution for a potato not to lose or gain any weight also the right sucrose concentration to keep it healthy. As I had time after doing the first set of results I redid the experiment under exactly the same conditions. This gave me a second set of results which gave me a more accurate view on and changes that occurred during osmosis. Using the results that I obtained, I drew this graph and as you can see there are no anomalous results, the solution with the highest average % change in mass is distilled water with about 20%. The solution with the lowest amount of % change is the 2M sugar solution with about -40%. So we decided that for the actual experiment we wouldn’t use 2M as it is pointless because we can tell from 1M that there is a high concentration of sugar. Therefore for the actual experiment we are going to use 0M, 0.2M, 0.4M, 0.6M, 0.8M and 1M. My aim is to investigate how different concentrations of sucrose affect the mass of a potato chip. Osmosis is the net movement of water molecules, through a selectively permeable membrane, from a region where there is a high concentration of water molecules to a region where there is a lower concentration of water molecules. Osmosis is a special sort of diffusion, where only water molecules can diffuse through a membrane. Larger molecules are unable to pass through small pores. The molecules will continue to diffuse until the area in which the molecules are found reaches a state of equilibrium, meaning that the molecules are randomly distributed throughout an object, with no area having a higher or lower concentration than any other. 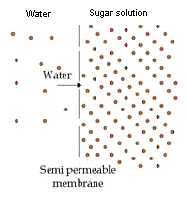 An example of osmosis would be when a substance such as sugar dissolves in water, the sugar molecules attract some of the water molecules and stop them moving freely. This in effect, reduces the concentration of water molecules. If the water molecules were on the left and the sugar solution on the right, then the sugar molecules on the right would have “captured” half the water molecules. There are more free water molecules on the left of the membrane than on the right, so water will diffuse more rapidly from left to right across the membrane than from left to right. This is also because the cell membrane behaves like a partially permeable membrane. I predict that if I increase the concentration of sucrose the potato chip will decrease in weight and become turgid (they become hard and swollen). This is because osmosis causes water particles to travel from a high region to a low region through a partially permeable membrane, it only allows water molecules as the sucrose particles are too big. The water moves to give an equal concentration of sucrose, the water from inside going outside until the concentration is equal. Therefore a high concentration of sucrose will have less water particles causing more water to leave the potato to make the amount of water inside and outside the potato even. So, 0m will have a higher mass as more water particles are outside the potato causing them to move inside whereas in 1m, there is more sugar solution causing the little water inside the potato to travel outside. We kept the same type of potato as we have to make sure that there is the same concentration of sugar and water. Volume of sugar needs to be the same to guarantee the rate of osmosis is the same. The lids have to be tightly closed to prevent evaporation. Storing the tubs at the same temperature to make sure the rate of osmosis is the same. Make sure the scales are set at 0. The potato has to be pat dry to shake of any excess moisture. Washing out the measuring cylinder after each solution is used. Using the same corer so that the potatos are the same size. Repeat the experiment to gain more results. Independent variable – we are changing the concentration, because a variety of concentrations will give me varied results which will help me come to a decent conclusion. Dependant variable – we are measuring the mass of the potato before and after we test it for osmosis. Controlled variable – we are keeping the potato, potato chips length, volume of solution, temperature and the length of time the same. For example if one of the potato chips were a cm longer than the others, it would have a larger surface area therefore a much bigger space for osmosis to occur. 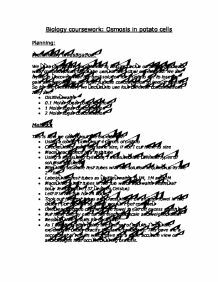 I have drawn a graph using the results that I obtained from the experiment. 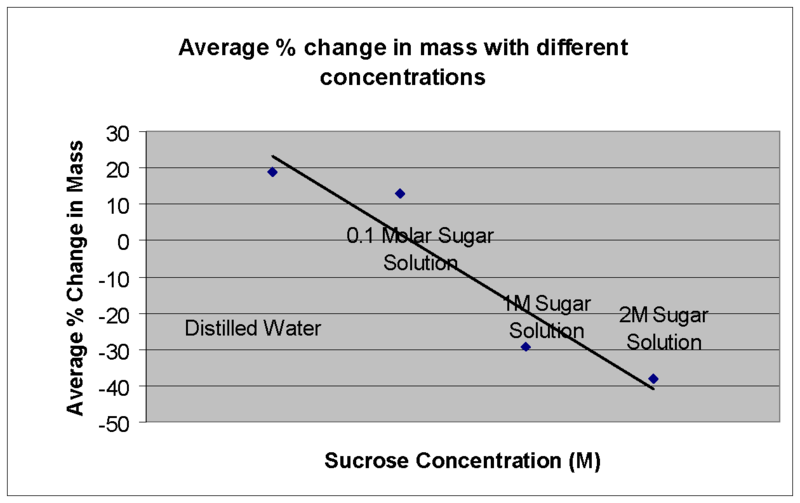 As you can see there are no anomalous results, my graph proves that my prediction is right because there is a pattern which shows that as the concentration of sucrose increases the average percentage change in mass decreases.It also shows that the potato cells increase in mass in solutions with a high water concentration and decrease in mass in solutions with a low water concentration. The graph shows that the amounts of percentage gain and loss in inversely proportional to the concentration. The gradient does not change in my graph. But as the percentage change in mass decreases the points come closer together. This is because the potato chip is becoming as flaccid as it possibly can. This results in the mass of the molar concentration becoming closer together. My graph proves that my results are fairly reliable as it fits in with my prediction of the experiment graph. 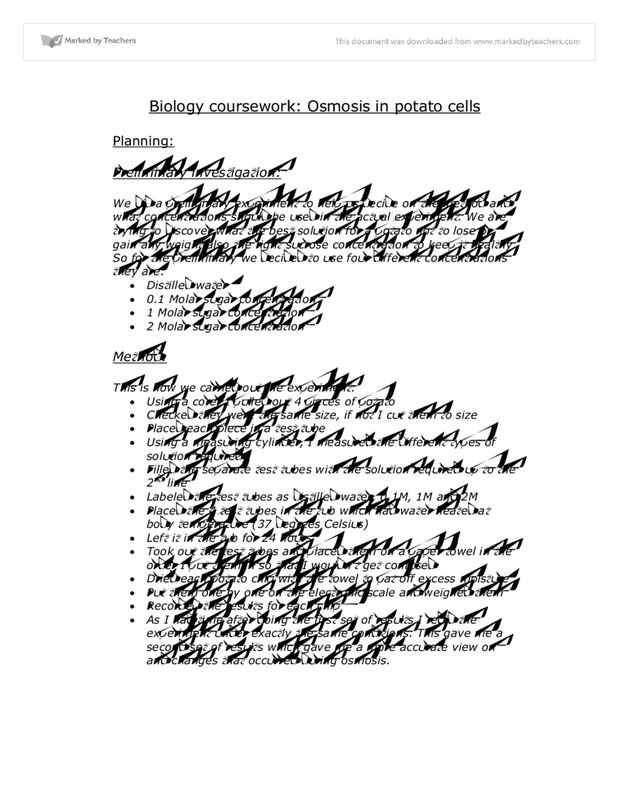 The cutting of the potatoes was the most difficult part of the experiment as although I was recording my results by mass, it could well have affected the surface area and so the overall rate of osmosis. If I were to repeat the experiment I would have possibly found a machine to cut the potato as it would ensure that all potatoes would be the same weight and dimensions. As well as the potato I could have found a more accurate way to measure out the solutions and to determine the molar concentrations. Perhaps I could have used a burette. This would ensure that I have an accurate amount of fluid in each test tube. I could also weigh each chip on a more accurate scale, e.g. not to 0.00g but to 0.0000g. Because of this I had to change my plan several times at the beginning because of things like wanting the potato chips to be originally 6-7cm in size. When it came down to the actual experiment I realised that the test-tube won’t be able to hold the potato chips that big so I had to cut it down to 5cm. I also had to change the size because of the fact that the potato chip caused the solution to overflow. The experiment was very successful in my opinion. I obtained a large quantity of very accurate results because I repeated the experiment 3 times from these valid results I was able to create an informative graph. The repeated results are fairly similar to the original this also helps to prove that my prediction was right. I think I took easily enough results for the amount of concentrations that I was using, and the time that I used for the experiment to last was enough to allow sufficient osmosis to occur. From this investigation I can conclude that the potato chip that was placed in the lowest concentration - 0M sucrose solution gained the most weight at 26.07%. The higher concentrations tend to lose weight as the 0.8M lost 24.47% and the 1M lost 34.47% as the potato could not expand further to take in more water, this is when plasmolysis occurred. The graph also shows a clear indication that was an overall decrease in mass during the experiment. If I was to repeat this experiment I would use a different root vegetable such as a carrot, sweet potato or a turnip. I would also use a different soluble solution like salt, this will prove that osmosis can occur in anything that has water. I would use an alternate method preferably the visking tube method otherwise known as the dialysis tubing. This is a good method to use as it is a semi permeable membrane that allows small molecules like water to pass through but does not allow larger molecules like sugar. If solutions of different concentration are on either side of the visking membrane, water molecules will pass through and tend to dilute the more concentrated solution. Osmosis doesn’t allow large molecules to pass through either that is why this is an ideal method to use. Then a ring of suitable bore rubber tubing is cut to make a band. If the level is too high the visking bag can be gently squeezed to force a little solution out of the top of the capillary. If the level is too low, a dialysis clip is attached just above the knot to reduce the volume of the bag. The level in the capillary tube will rise as the water passes into the visking bag to dilute the stronger solution inside. 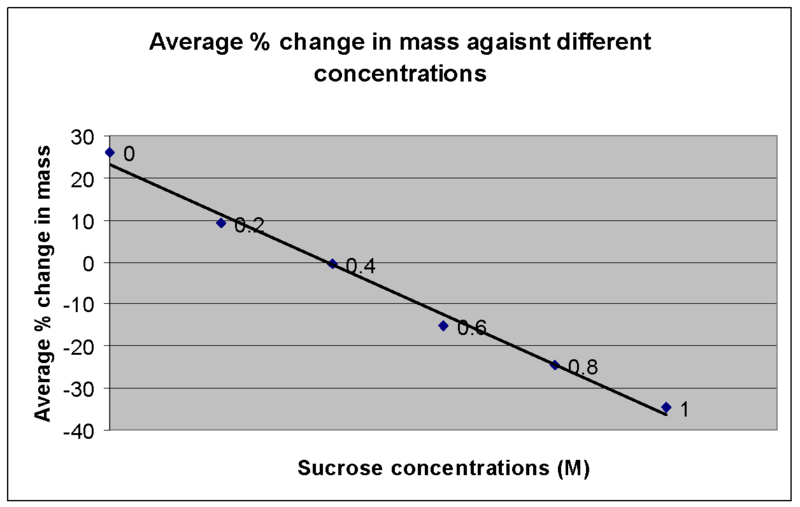 I expect osmosis to take place and to see the pattern that of the concentration of sucrose to increase as the average percentage mass to decrease. Because substances in the agar react with the gases in the air some of the agar got partially decolourized, this also could have caused errors in the experiment but on the whole the experimental errors were within the range and so the experiment was a successful one. This is because more or less solution may be absorbed depending on time. I am going to keep each potato chip in each solution for nine days. The surface area of the potato chips will be kept the same by having all the chips the same size. If there is a greater surface area through which osmosis is to take place then the rate of osmosis will take place faster, whereas if the surface area is restricted osmosis will take place slower. I am trying to investigate the rate of osmosis of water molecules in a potato that has been placed inside a sugar solution.